I am a Jew. I am a Christian. And I practice “magic”. To me, Judaism is not only a religion but an ethnicity. My first clue was when one of my best friends in high school, who was Jewish, admitted that she was also atheist. “Also” being the key word. I am an ethnically Jewish person who accepted Yeshua. So far, I have found nothing about the Jewish practice that hinders Christian practices. Yes, Rebekkah, you CAN observe Passover AND Christmas (not that Christmas has Christian roots but that is another can of worms). Admittedly, I am a terrible Jew. I still have to stop and think about how many candles are on a menorah (and if asked, I’ll answer, “Depends. Is it in the home or the temple?” See? Im doing my homework). Now back to the bit about magic. As I am descended from a long line of superstitious gypsies, my magical dabblings should not be a surprise. My Pop Pop only writes in green ink and my mother performs blessing rituals prior to taking up a new residence as a way to “get the booger bears out”. Anyone who has partaken in a Passover seder knows that that is one heck of a ritual. Salt, water, prayer, candle-lighting, incense…those religious rituals don’t look any spookier than what I do. As Mr. Becker (the Christian Sorcerer Therapist I mentioned above) points out, there are “only a small handful of magical skills forbidden in the Bible. Much of magic is open to practice. Magic as a whole is never forbidden in the Bible and witchcraft/sorcery are terrible translations of the original words which really meant “root cutting” or “poisoning”. The forbidden “magical” practices, by the way, are Necromancy, Divination, and Enchanting. Now, if Im being honest, I DO pay a little too much attention to Astrology, which falls into the realm of Divination and while I don’t cast stones Christian psychics like Chip Coffey for chatting with dead folks, I steer clear of it myself because it can be dangerous (which is why I think G-d forbade it in the first place). As far as Enchanting…if I knew how to bend someone to my will, I’d have a Stepford husband and children by now. 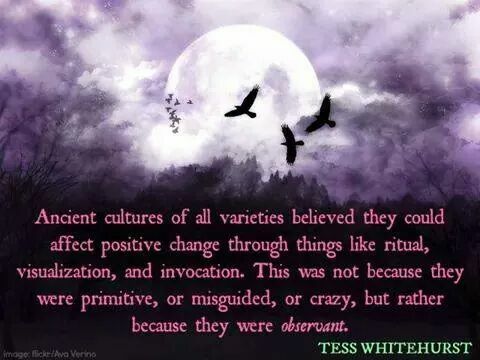 So I collect rocks, burn things, bury things, blend oils and herbs and chant occasionally. Some call it “casting” or “meditation”. I call it prayer.